The 32.9 metre motor yacht Atlantic, listed for sale by Bob Cury at RJC Yachts, has been sold with Bryan Long at Westport Yacht Sales introducing the buyer. Built in GRP by US yard Westport to a design by Jack Sarin, she was delivered in 1998 as a Westport 108 model, the forerunner of the current 112 series. The interior accommodates eight guests in a master suite, two doubles and a twin cabin — all with entertainment centres and en-suite bathroom facilities — plus crew quarters for four crew members. The main saloon has an open-plan design with a formal dining area forward and there is also a dine-in galley with a dinette for informal snacks. Exterior guest areas include a sun deck that hosts a bar, seating area and Jacuzzi. The aft deck is expansive and hosts al fresco dining for eight guests with amenities including comfortable seating for eight, a bar, fridge and a flatscreen television. She underwent a major refit in 2015 including a complete paint job, a new custom interior by Architectural Interiors, upgraded Garmin electronics plus many more upgrades. Additional large yacht options include Northern Lights generators, Naiad stabilisers, and a bow thruster. Atlantic is powered by twin MTU 1,525hp engines that can deliver a top speed of 21 knots and cruising speed of 18 knots. At 12 knots she has a maximum cruising range of 2,500 nautical miles. 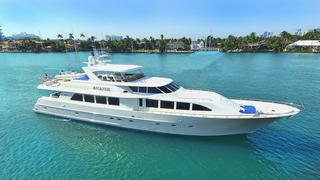 Atlantic closed within 60 days of having been listed for sale and her asking price was $2,795,000.